It may just be an Italian tale, but I believe that salting the eggplant prior to cooking is best. It’s suggested to let them sit for up to an hour, but impatience always strikes me. Soaking the eggplant pulls out the juices that carry the bitter flavors and helps to draws out the moisture, also helping prevent the eggplant from absorbing too much oil, which can make them greasy. Sprinkle your eggplant slices with salt on both sides ***Be sparing with the salt. As many may know, it is known to both contribute to heart disease and causes your body to retain water, negatively impacting weight loss efforts) and allow to dehydrate for up to an hour. Sparingly paint eggplant slices with olive oil and pressed garlic mixture. Heat a grill pan (or saute pan if unavailable) over high heat. 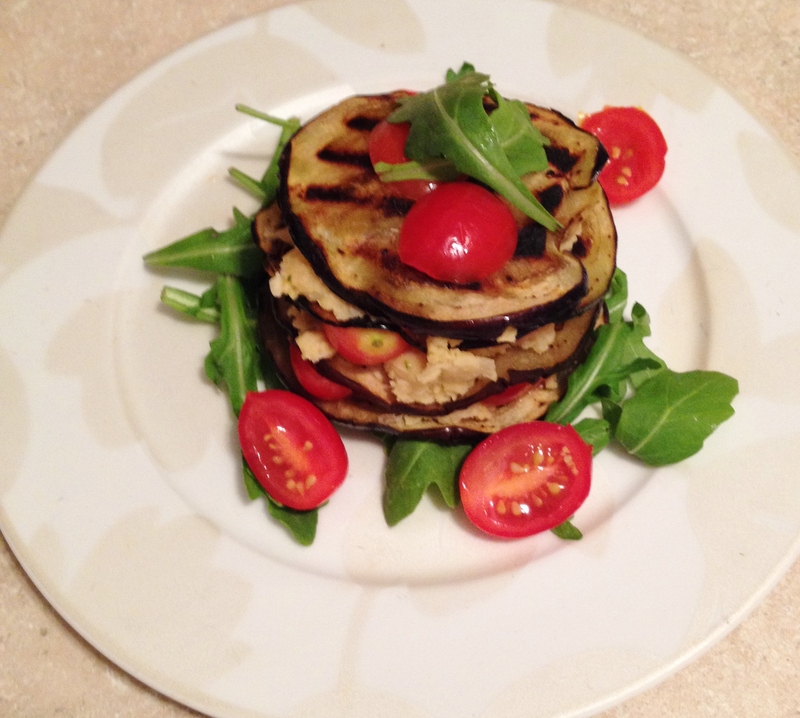 Lower to medium and add the eggplant slices in a flat surface. You may have to do this in groupings depending on your pan. Flip after a few minutes when marked with grill lines and repeat for the other side. Lay each slice on a paper towel lined plate when finished. Meanwhile, blend or mash the “chickpea mash” ingredients together with a fork to desired consistency. 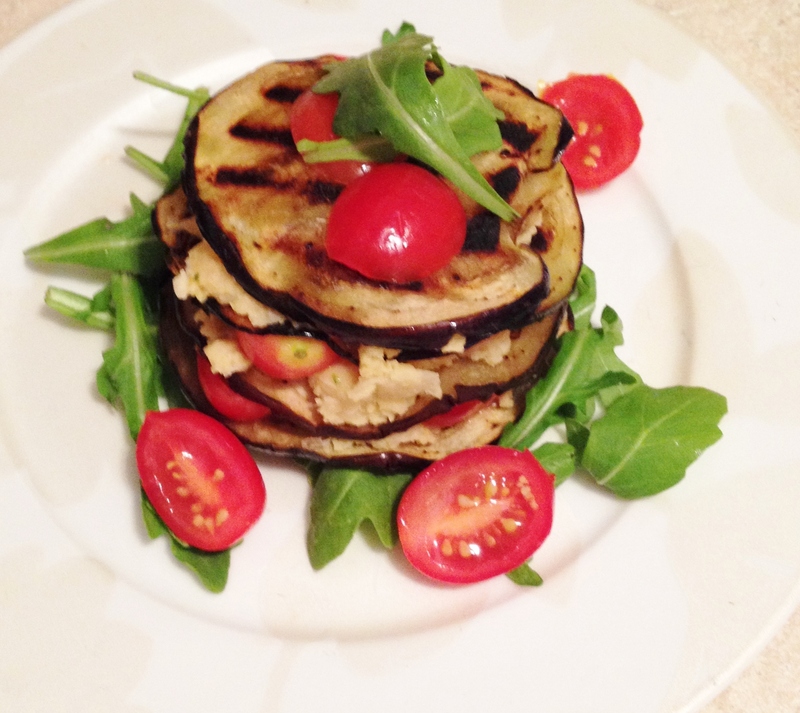 Assemble Eggplant towers in layers starting with the slice of eggplant, followed by a scoop of Chickpea mash (spread out), a slice of tomato (or two!) and another layer of eggplant. Repeat as many times as you would like. Serve over a bed of arugula for a little bite. I highly suggest making a balsamic reduction to drizzle over this dish. I wish I did! Here is a recipe from Joyful Healthy Eats.